It is normal to see people get frightened when they hear the word ‘debt’. It is so because when you’re in debt, it means you owe someone a sum of money. But that doesn’t always be the case in a financial term. First- let’s go to the definition. External debt refers to a country’s debt that was borrowed from foreign lenders, including foreign commercial banks, foreign governments or international financial institutions such as the World Bank and IMF. This is the debt undertaken in non-RM currency. It is important to note that the country’ debt doesn’t confine to the government only. Rather, it is the combination of all residents comprising both public and private sectors. A caveat: residence is determined not by nationality, but by where the debtor has headquartered their center of economic interest. Therefore, if any Mat Salleh borrows some USD money from Cayman Island and invest it in Malaysia, that should be taken into account. The same goes to Malaysian citizens who bought the Euro dominated bond from Citibank Jalan Ampang. So we know that the external debt here means the non-RM debt taken by the government, the private sectors, the big companies, the investors, the riches, or possibly you and me. Semua kasi campur. Second- what constitutes the debt? For example- the Jambatan Kedua Pulau Pinang was built using Renminbi-loan from China. That is external debt. Another example is the 1MDB’s bond that is guaranteed by the government. That is also the external debt. Basically, whatever you owed in non-RM and any non-RM debt you become a guarantor, that have to be considered as external debt. 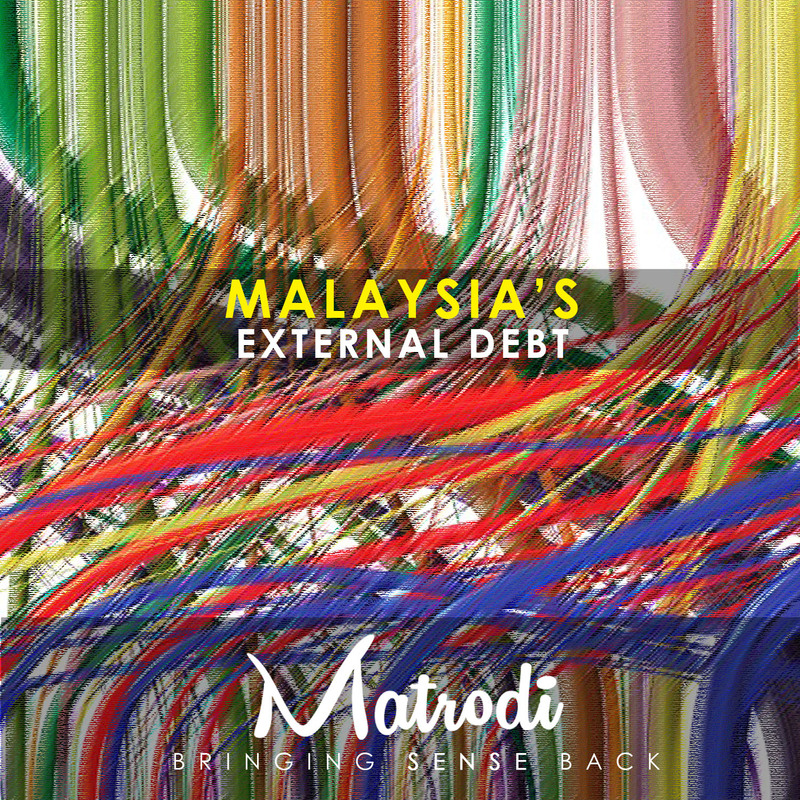 Now back to the RM740 billion questions- why Malaysia’s external debt is tripled than 2013? The answer: It was simply because of the new definition in international debt reporting standard starting last year. Previously, you only count the government and private non-RM debt. But today, you must include external offshore loans, public enterprises and the private sector non-RM debt, government-guaranteed non-RM debt and also Ringgit denominator security debt held by foreigners. In other words, the debt-bracket has been broadened and expanded. To illustrate the point- the 1MDB’s bond is guaranteed by the government. In reporting country’s external debt, this has to be included. Previously it won’t. But the sharp increase is merely on paper. It is considered on paper because the actual debtor is 1MDB, not the government. The government only acts as the guarantor. It’s like when you become a guarantor for your son’s PTPTN, the amount owed is considered your external debt. In calculating your net worth, you actually become ‘poorer’ due to your son’s debt. But is it so? Or you just become ‘poorer’ on paper? The same goes to the government’s external debt. As a matter of fact, two-thirds of the increase is caused by foreigners buying Ringgit-denominated securities. This is not surprising considering all the billions raised from the sukuk/bond issuance for MRT and ETP projects. Seems the figure is too big (well, almost a trillion Ringgit), should that be a concern? No. Singapore’s external debt is RM3.13 trillion. South Korea is RM1.13 trillion. Indonesia is RM927 billion. And you can imagine how many trillions ‘debt’ are there for most of the developed countries. So, since the external debt is the cumulative debt undertaken by all Malaysians and the sharp increase is due to the new definition of external debt, how much did the government borrowed externally? The real debt-lah. The Government’s debt stood at RM582.8bil. Of the total, 97.1% or RM566.1bil was domestic debt, while the remaining RM16.8bil or 2.9% was external debt. There you go- the real figure that you need to be concerned. RM16.8 bil. Not much ha?